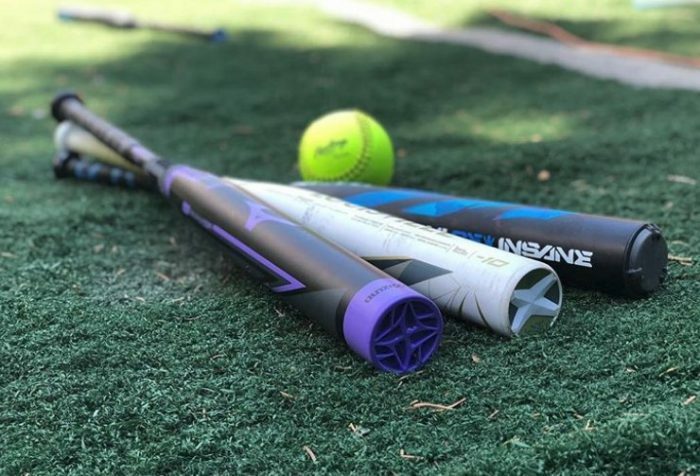 We took the swing weight of every high end composite 2019 fastpitch bat. We found that those in the 32/22 have a range swing weight by over 10% depending on the model. However, there is no industry source to report actual swing weights. We fix that here. (You might also like our BBCOR, USA and USSSA swing weight pages). As well, expect to see each of these 2019 bats reviewed on our fast pitch bat review page. Here are our measurements on the 2019 class of fastpitch bats in a 32/22 size. The bats in the upper (i.e. 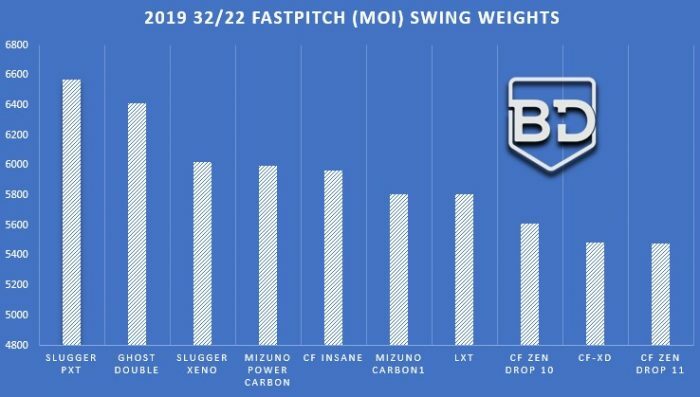 expensive) 2019 bat class range upwards of 12% different in swing weight. At the heaviest, we found the Slugger PXT and Ghost Double Barrel to swing similarly—and heavy. Expect 10% more difficulty in swinging these bats when compared to the CF Zen or LXT in similar legnths/drops. We should also note, we measured ONLY the 32/22 versions of each of these bats. It is industry standard to change with each inch by 10%. Meaning, the 33 inch versions of these bats should be 10% higher across the board. However, there is no gaurantee that each company, or bat model, follows that exact standard. The CF-XD, we note elsewhere, is an adjustable length bat. That is, you can move the knob up and down the handle up to an inch. This changes the swing weight as you move the pivot point more towards the end cap. Our measurements showed almost exactly what DeMarini claimed. That is, a 5% change in swing weight per half in change in bat length. Swing weights are not intuitive. That is, the idea of a swing weight isn’t naturally obvious. Many confuse swing weight with scale weight. But, as we’ve proven elsewhere, scale weight and swing weight are not well correlated at the margins. That is, comparing the actual weight of bats stated to be 22 ounce won’t be a good indicator of how they swing compared to one another. The balance point of the bat, on the other hand, is a decent indicator for how one bat swings compared to another. A layman’s way to determine which bat swings heavier may be to see which bat has a balance point closer to the end cap. You can do this, roughly, by balancing the bat on your extended finger. Then mark the spot where it balances. Comparing those marks across similarly length bats is a good indication of how difficult they are to swing compared to another. What is the actual weight of the CF Zen 32/22 and the 32/21 CF Zen ? You are right in that they are not perfectly positively correlated. The MOI for the PXT is accurate and, in terms of swing weight, it will swing heavier (at least in the 32/22’s that we measured). While the balance point and the MOI are generally correlated they are not one and the same. You’ve found a case where it is not true. Hope that helps and thanks for the perceptive comment/question.